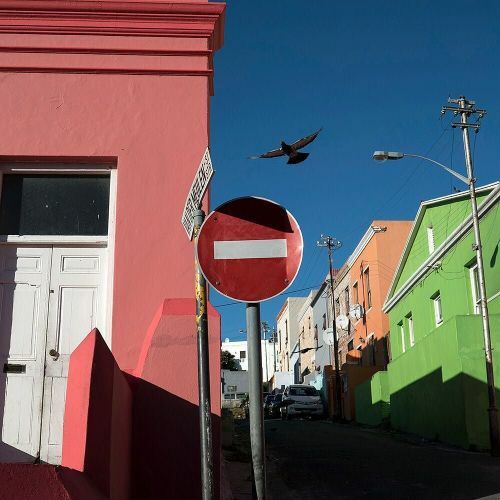 "A colorful walk through Cape Town's Bo-Kaap district, home to the first mosque in South Africa and considered the birthplace of Islam in the region. Most of the area's residents are Muslim South Africans, descendants of slaves from other African nations, India, Indonesia and Malaysia who became known over the centuries as Cape Malays, or Cape Muslims. During the apartheid era, strict laws against the mixing of races resulted in the preservation of the Bo-Kaap and its culture. But like the rest of South Africa, the neighborhood — with its brightly colored Cape Dutch houses and dramatic views of Table Mountain — has been changing since the end of apartheid in 1994. Now, residents fear that their traditions and close-knit community are at risk as money pours in. The @nytimes staff photographer @joaosilva_nyt took this photo while on #nytassignment." By nytimes on Instagram.